The latest generation of geothermal distributors in the system of ground source collector system for ground source heat pumps (GSHP). 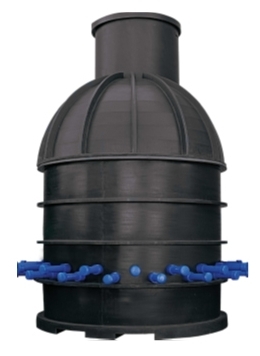 Permanently mounted in a black plastic casing of the so-called "distributor well". Place of assembly / installation: outdoors, buried in the ground. The ability to connect 20 to 30 ground heat exchangers. Material: PEHD 100 RC. Supply and return sections arranged in pairs side by side. 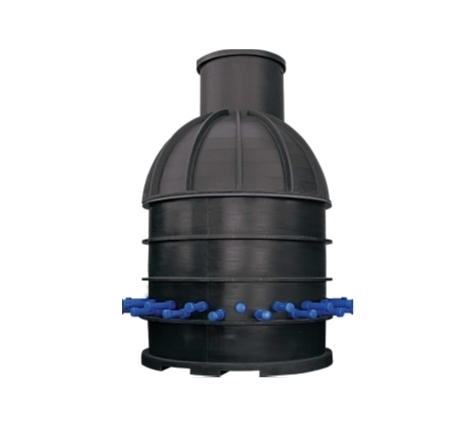 They enable connection of the heat exchanger conduits (distribution pipes) so as to prevent crossing around the manifold well. Available in configerations of 20 - 30 way with 8 - 38 ltr/min flow meters as standard.